Last night we attended “Champions for a Cure” – a charity melanoma event in San Francisco benefiting the Melanoma Research Foundation. The best part was meeting others with melanoma. We didn’t know what to expect. So we were stuck by how young (and great looking) everyone was! 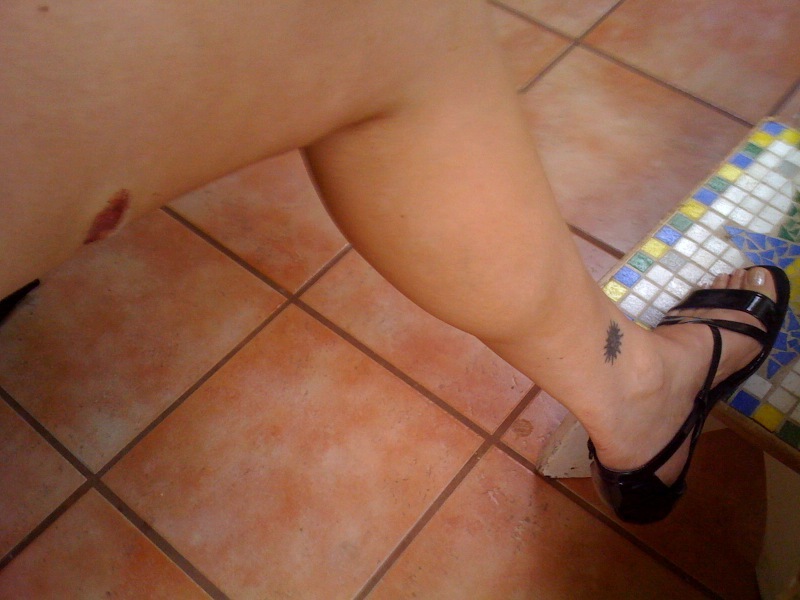 It was nice to meet Erin, who helped organize the event – so funny to compare scars! We laughed that the people with melanoma should wear some kind of badge so we could find each other. I wanted to go around the room and ask – do you have melanoma? You would never have known by looking. Everyone looked so great. It was a bittersweet evening. Watching a 26-year-old with Stage 3 melanoma cry during most of her speech was heartbreaking. And another young lady (stage 4) also in her 20s – found out she has a new tumor 2 days ago after being on an experimental gene inhibitor trial that seemed to be working for her. It is so frustrating and sad. They spoke of the new drugs that are just on the horizon for melanoma and everyone agreed that we are finally at a turning point. There have been no new drugs for melanoma approved for over a decade. We will soon hear about some new drugs with the ASCO June conference approaching. The evening raised a ton of money with a great live and silent auction. They auctioned off a lunch date with Lisa and Brittny Gastineau – from the reality TV show about the New York socialites. Lisa is a recent melanoma survivor. It is a very exciting time for melanoma research. 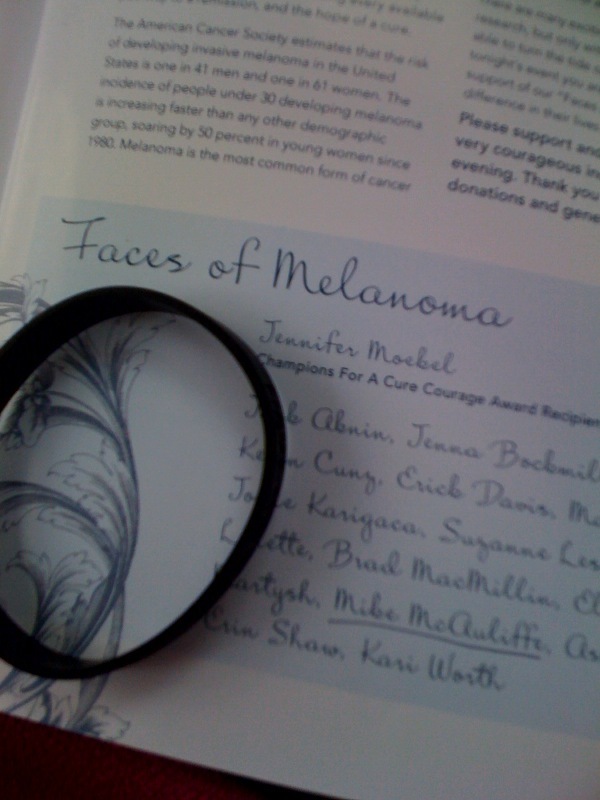 So I encourage all of you to donate to the Melanoma Research Foundation. Not only do they help support the patients mentally with online forums, they fund the research to battle melanoma. We like the black wristbands that we got. They say ‘fight the beast’…so fitting for melanoma. May is melanoma awareness month. So I preach to everyone to get their skin checked. I actually switched primary doctors so I could get a referral to a dermatologist. My previous doctor had made me feel like a hypochondriac when I asked her to check some moles after telling her my husband had just been diagnosed with melanoma. She looked at the moles and brushed me off. So I switched doctors and I am now under the care of Mike’s doctor who immediately gave me a referral to the dermatologist for a mole map. So this week I went to the same doctor that diagnosed Mike. It was weird sitting in the same place where he got the news – but back then, ignorance was bliss and we were clueless as to what melanoma meant. Now that I was so hyper aware of my moles and skin and the consequences – I waited nervously for the doctor. When she came in, I told her my sins and we discussed my situation. She asked me to make the decision about two moles that she wasn’t that worried about, but knew leaving them there would just stress me out. One on my chest, one on my thigh. One tiny little black mole and one small brown/tan mole. They only exhibited two of things to watch for in the ABCDEs of melanoma. But I told her to take them off. Good bye, good riddance. Biopsy results in a week. As she whipped out her knife, she told me how she had diagnosed some very young people with melanoma. In their 20s. At the same age I was when I got my sun tattoo, these young people were being diagnosed with cancer. It really makes me wonder what is causing this disease to strike young people and older people more often than before – is it the sun/ozone, sunbeds, or something else we just aren’t aware of yet? Anyway, I hope you all will get your skin checked. The biopsy doesnt hurt, I promise. Get the melanoma off early and its highly curable. Let it sit and you are playing Russian Roulette.